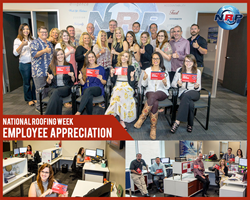 National Roofing Week Employee Appreciation! Here at NRP, we strive daily to bring the highest level of professionalism and quality to every job. National Roofing Partners (NRP), the leading network of commercial roofing contractors in North America, is proud to join roofing professionals across the country celebrating National Roofing Week. Organized by the National Roofing Contractors Association (NRCA), the week helps to increase recognition of the significance of roofs to every home and business, stress the value of professional roofing contractors and promote the good deeds of the industry. National Roofing Week is taking place June 4-10, 2017. As one of the most important components of a structure, the roof is often taken for granted until it falls into disrepair. National Roofing Week enables roofing professionals to engage in their audiences and inform the public about the essential role roofs and professional roofing contractors play in every community. National Roofing Week takes place each summer. Its mission is to increase awareness across the U.S. about the significance of roofs to every home and business and the professionalism of all the people employed in the industry. National Roofing Week also promotes the importance of hiring a professional roofing contractor and making informed decisions about maintaining or replacing any roof system. Additional information about National Roofing Week can be found at http://www.nrca.net/roofingweek. NRCA is one of the construction industry's most respected trade associations and the voice of roofing professionals and leading authority in the roofing industry for information, education, technology and advocacy. It represents all segments of the roofing industry, including contractors; manufacturers; distributors; architects; consultants; engineers; building owners; and city, state and government agencies. NRCA's mission is to inform and assist the roofing industry, act as its principal advocate and help members in serving their customers. NRCA continually strives to enhance every aspect of the roofing industry. For information about NRCA and its services and offerings, visit http://www.nrca.net.